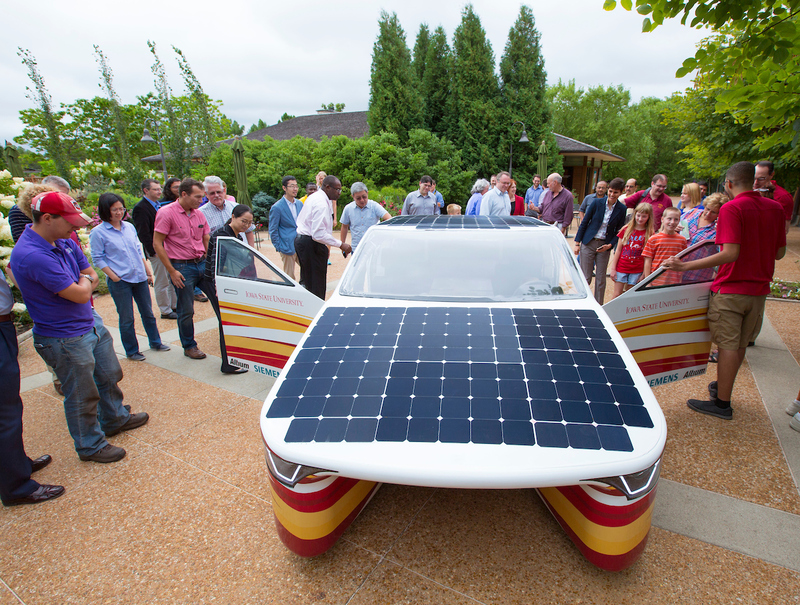 Mechanical engineering faculty members and some visitors to Reiman Gardens take a close look at Penumbra, Team PrISUm's latest solar vehicle. Larger photo. Photo by Christopher Gannon. AMES, Iowa – Iowa State’s mechanical engineering faculty, taking a break from a pre-semester retreat, surrounded Penumbra, Team PrISUm’s latest solar car. They peeked through the four doors. They took a look under the hatchback. They worked their way around what the team likes to call a "Solar Utility Vehicle." They asked good, smart, engineer questions. And, the members of Team PrISUm hope, they saw a glimpse of the future. The previous 13 cars designed and built by teams of students were sleek, low and light single-seaters purpose-built for racing. They were hot, cramped and all about efficiency. Comfort and utility were not priorities. Now look at Penumbra, named after the area of half shadow created by a solar eclipse. It’s a unique project for Team PrISUm: Four seats, cup holders, room for groceries, stereo system with infotainment display, 15 horsepower, two-wheel drive, a top speed of 72 mph and a comfortable ride. First, though, the student-engineers of Team PrISUm are going to drive Penumbra across Australia as competitors in the Bridgestone World Solar Challenge. Australia? Why race across the middle of Australia? Team PrISUm, after all, has been on an American roll. The team won the 2015 Formula Sun Grand Prix at the Circuit of the Americas race track in Austin, Texas. Last year, the team overcame electrical, mechanical and weather challenges to finish a respectable seventh in the American Solar Challenge, a race to and from national parks and historic sites between Ohio and South Dakota. So they started planning a different kind of car that would qualify for the world race’s cruiser class and its emphasis on practicality. And they started raising money toward their $300,000 goal. Now they have a spread sheet detailing every step of getting a car and 15 students to Australia, a clock on their web page counting down the weeks, days, hours and minutes until the race starts, fall semester schedules featuring senior engineering design and other classes focused on their solar car work and $650,000 of in-kind contributions of software, materials and expertise from industry partners. They also turned their annual “SunRun” outreach tour into a three-week, 99-county test drive of their new car, said Matt Goode, a graduating senior from Coggon who’s studying materials engineering and is the team’s past project director and current co-president. How else would the team learn that door panels would fall off when little kids banged around inside the car? There were more formal tests and bigger lessons, too. A visit to Ford Motor Co.’s wind tunnel in the Detroit area, for example, revealed the car’s drag coefficient is about .20. That will help Penumbra move efficiently down the road. But that’s a very long road across Australia. Can Penumbra cover every mile? And when the racing is done, Goode said team members have even bigger dreams in mind. Team PrISUm is preparing to take its new "Solar Utility Vehicle" on a 1,900-mile race across the Outback of Australia. The Bridgestone World Solar Challenge is Oct. 8-15. Iowa State's student-engineers think they've designed and built a car that can comfortably make that journey. Map by Bridgestone World Solar Challenge.